"I'm not getting in one of those small planes because they fall out of the sky all the time!" What kind of safety record do small planes have? You know the old saying - there are lies, darn lies, and statistics. There are many was to slice the data and sometimes it is bit confusing and difficult to make a comparison between different modes of travel. Traveling by small plane is basically safe and the safety record continues to improve year over year (see chart below). The steady improvement of the GA safety record is the result of dozens of programs within all areas of GA, from pilot education and training, to better technology, to improved operating methods and practices, to a more complete body of knowledge learned during more than 100 years of flying. 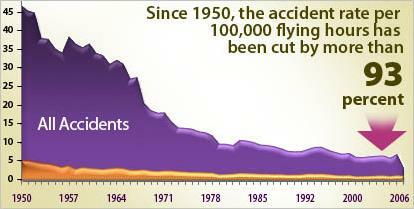 For example in 2006 general aviation planes flew of 22 million hours with only 303 fatal accidents. In addition, the type of risks that are experienced are different from other types of travel - in an automobile there is a greater chance of being involved in an accident that is not your fault - in an aircraft nearly all accidents can be traced to a preventable action. In other words - you are as risky as you choose to be. The differences between commercial flying and private flying is similar to the differences between commercial and private driving. Private planes go to many different airports, most of the time without having been there before, while commercial aircraft offer transportation to limited number of airports. Additionally, private aircraft don't usually have two person flight crews and the intense training that airline pilots have to endure. The good news is that there are many programs available to assist pilots in being safe. At Horizons Aloft we place the top priority on safety and all of our clients will be given an exhaustive list of available safety programs and a list of recommendations specifically for you. Some of these programs will work on maintenance issues, some of pilot proficiency, and others for thorough preflight planning.